This Salter mandoline enables you to grate and slice food easily, quickly and precisely, saving time when you are preparing a meal and preventing a mess. 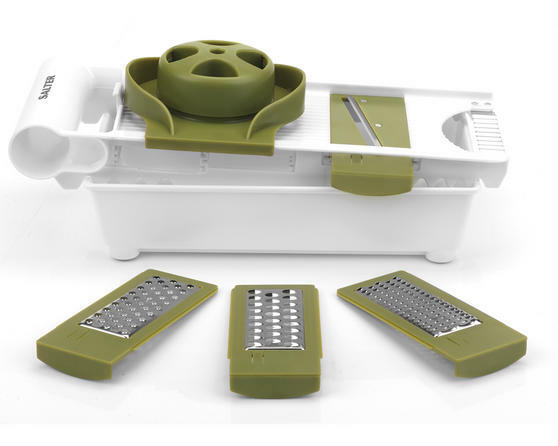 With 4 blades, you can choose between a variety of grating and slicing thicknesses, so you can get perfectly cut cheese, vegetables or fruit every time. The sharp stainless steel blades are durable while the soft grip handle makes it easy and safe to use. In smart looking green and white, this mandoline is the perfect addition to your cookware. 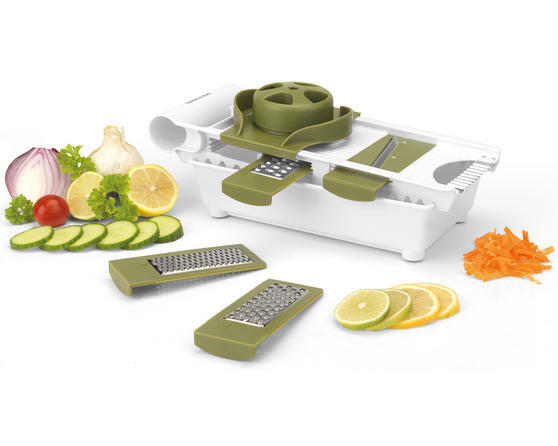 This versatile mandoline is ideal for slicing or grating cheese, fruit and vegetables quickly and without difficulty for great results. It comes with four sharp interchangeable stainless steel blades which allow you to switch between cutting thicknesses at ease. Measuring 31l x 14w x 12.5h cm, the mandoline is compact and easy to store in a cupboard or drawer, but not too small or fiddly to use. Simply select the blade and place it in the mandoline, put the food into the moving handle section then slide up and down the blade. The sliced sections will fall into the bowl below for you to collect afterwards, leaving no mess on the table for you to have to clean.